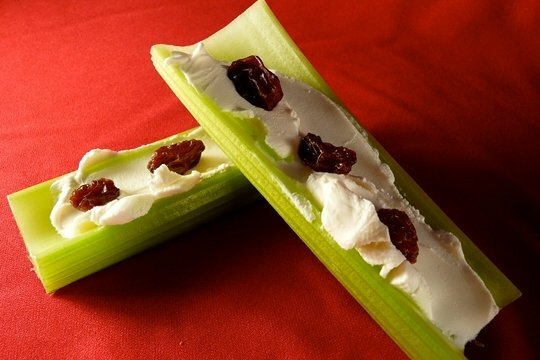 Ants on a log is a combination of celery, cream cheese (or peanut butter), and raisins. All you do is spread on the cream cheese, add the raisins, and voila! Let your imagination run wild with this snack. Maybe you don't like ants - so these can be "frogs on a log" and you can be the alligator. Sneak up to the unsuspecting frogs and CHOMP! This kid friendly snack can be made with cream cheese or peanut butter. If you are watching your weight, try a whipped cream cheese for fewer calories. Dress these up with almond butter or dried cranberries. Skip the celery completely and use an apple. Whatever you do, you will end up with a great tasting combination of fruits, vegetables, protein, and fun. I LOVE this snack! I remember it all the way back to childhood (getting to be a long time ago). One time, to make it easier to make them, I mixed some raisins into a peanut butter jar to save time. GENIUS! Or at least I thought it was. My mom wasn't so impressed.